Dr. Michael G. Papaioannou serves as an Expert Advisor at the International Monetary Fund and is a Visiting Scholar and Professor at the LeBow College of Business, School of Economics, Drexel University. He was a Deputy Division Chief at the Debt and Capital Markets Instruments, Monetary and Capital Markets Department of the International Monetary Fund until July 2017. 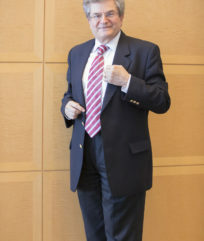 While at the IMF, he served as a Special Adviser to the Governing Board of the Bank of Greece and led numerous IMF missions on developing economic and financial policies for emerging market and developed economies, designing and implementing sovereign asset and liability management frameworks, developing local currency government bond markets and instruments, and establishing and managing SWFs. Prior to joining the IMF, he was a Senior Vice President for International Financial Services and Director of the Foreign Exchange Service at the WEFA Group (Wharton Econometrics Forecasting Associates) and served as Chief Economist of the Council of Economic Advisors of Greece. He has also taught as Adjunct Associate Professor of Finance at Temple’s FOX School of Business and was a Principal Research Fellow at the University of Pennsylvania, Department of Economics, LINK Central. He holds a Ph. D. in Economics from the University of Pennsylvania and an M.A. in Economics from Georgetown University, and has published extensively in the area of international finance.